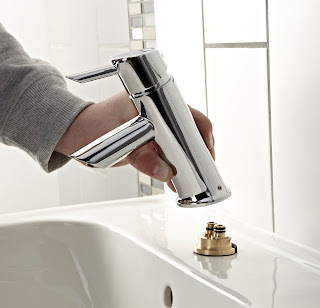 Fitting taps is not technically difficult but the locations you have to wriggle into and under can turn what should be a simple job into a bit of a nightmare. As I mentioned in the Home plumbing manual, throwing away the copper pipes that come with most taps and fitting flexible tap connectors can make things much easier but it's still the kind of job that most plumbers try to avoid because it's such a pain. However, help may be on its way in the form of the new range of Bristan Easyfit taps. Basically the tap now comes in two parts. You fit the base, which comes with flexible connectors and isolation valves, and then, when you've finished the tiling and applied your sealant lines, you fit the tap onto this base! We had a play around with this last year up at Bristan’s offices. Yes, there were a few issues at the time but the fact that they'd made a point of asking installers to try them out and give them feedback is in itself a wonderfully sane approach to plumbing design - although sadly not one that seems to have caught on much within the industry. Of course the main benefit of a two part tap comes later on when you need to update it or just give it a good clean. Instead of having to burrow under the basin or bath for a sweaty and frustrating half hour you can just isolate the water supply and then remove the tap body from the top and fit the new one into place. What could be simpler? Yes, you’d have to replace the old Bristan tap with a new Bristan tap, but I can think of many more traumatic things in life. Over the last few yeas we've come across a number of customers who have had problems with these taps, mainly because the grub screw that holds the tap in place fails, the tap blows off and a deluge ensues. I have to assume that Bristan are sorting this out - more than 1 grub screw and some sort of locking mechanism would seem sensible - but I don't know for sure. With this in mind you might just want to check the grub screw every 6 months or so and just give it a little tweak to keep it in place. Within the Haynes Home Plumbing manual I discussed at some length the pro’s and con’s of the various push-fit piping systems. 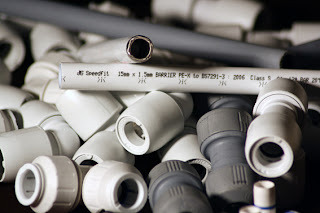 Personally I avoid plastic pipework where I can for no other reason than I think copper looks better and is cheaper to work with – the pipes are about the same price but copper fittings are no where near the price of their plastic counterparts. That said, for the DIYer plastic piping is a Godsend. At the time of writing Wavin had two products on offer; their old traditional Hep20 product, which could be recognised by its uninspiring battleship grey colour and the fact that you couldn’t get the fitting off with any ease once you’d managed to get it on, and their new product, which they were calling “In4Sure”. Well a few weeks ago I popped into the local plumbing merchants to find them putting all the old grey hep20 fittings into bags for return to Wavin. It seems that two things have happened, firstly that the old grey system has been recalled and secondly that the chaps at Wavin are keen Startrek fans - In4Sure is now being heralded as the “The Next Generation hep20”. You can still find it called In4Sure but I suspect this name will be quietly dropped over the coming years to make way for “Hep20 Voyager”, and “Hep20 deep space 9”. To be honest this is a well overdue move. The old hep20 wasn’t a patch on most of its rivals, whereas In4Sure contains a number of sound innovations that bounce it right back up there. Put the kibosh on it. In the Haynes Home Plumbing Manual I talked about dealing with burst pipes and suggested a clamp repair kit as a fairly useful piece of kit to keep in the home (p39). 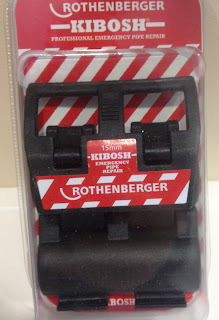 Well Rothenberger have recently brought out a neat little adaptation to this called the "Kibosh". The principle remains the same - you open it up, place it over the leak and then clamp it shut. Of course it's only a temporary fix but it gives you time to draw breath and decide how to effect a permanent repair. The design means that it should be relatively easy to get it onto most pipework and it's small and neat enough to rest unnoticed in kitchen drawers for years at a time without cluttering up the place. The current Kibosh is only designed to repair 15mm pipework, which means that for the next few months only your 22mm pipework will be prone to spontaneous bursting - for such is the law of Sod. However, different sizes will be out soon. The 15mm version costs about £12 - when I asked at PTS they said that was the RRP so you ought to be able to beat them down a bit - but to fully cover yourself you're going to need a version for every pipe size in your home, which could make it an expensive business. Another thing that worried me when I first saw it was that it was so small. If a pipe bursts because it froze, the ice usually causes the pipe to swell up a bit for at least 5cm on either side of the actual fracture. Can the Kibosh cope with this? Well, frankly I haven't a clue but I'd be surprised if they hadn't already considered this. To be honest it looks a really well thought through design that's well worth buying for that rainy, floody, day. 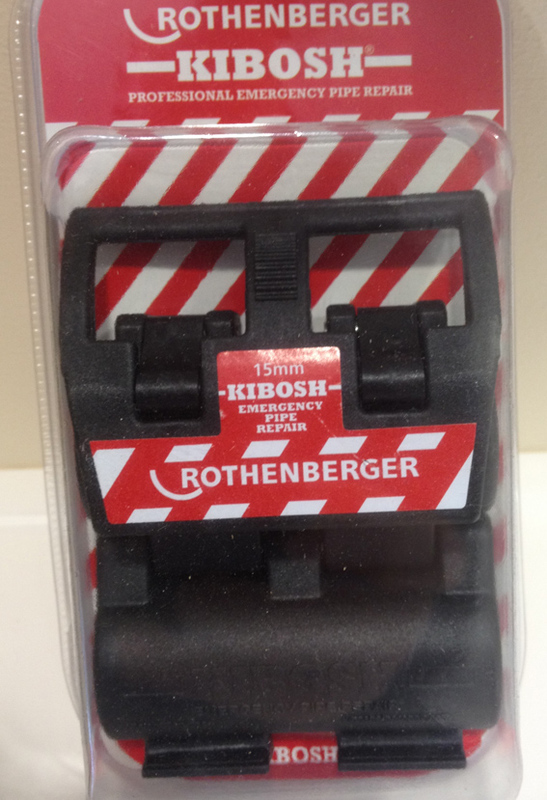 Word of warning though - don't wait until you have a flood before reading how to use the Kibosh, have a practice first.